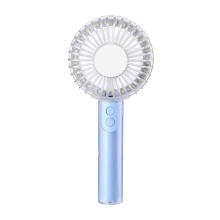 Portable rechargeable handheld fan, which is a combination of fan and makeup mirror. It not only can keep you cool in summer, but also can help you perfect your makeup at any time. What&apos;s more, it is equipped with detachable base, which can be used as mobile phone desk holder, allowing you enjoy the cool wind and watch videos simultaneously, very practical and convenient. Portable and handheld size, easy to carry. This fan is designed with mini makeup mirror, which not only can keep you cool in summer, but also can help you perfect your make up at any time. One button to switch 3 wind speeds, you can choose the speed as you like. Built-in 21pcs LED beads, soft and bright light, providing enough light for make up or taking selfies. Equipped with detachable base, and the base can be used as mobile phone desk holder, convenient for you to enjoy the cool wind and watch videos simultaneously. USB rechargeable design, easy to be charged by connecting laptop, computer, power bank and other USB-enabled devices. Mute design, no disturbing to your sleep or work. Portable and handheld size, easy to carry. Suitable for home and office use, or for traveling, camping, hiking, etc. A perfect partner to accompany you in summer.